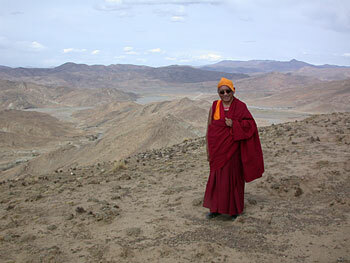 Lama Zopa Rinpoche, Tibet, June 2002. Photo by Ven. Roger Kunsang. Somehow, this trip to Tibet “just happened.” Several hundred people originally signed up for a pilgrimage to Mt. Kailash with Lama Zopa Rinpoche. This changed to a long-life retreat at Maratika Cave, Nepal (which was scrapped due to Maoist activity,) and became a Mahamudra retreat at Lapchi, where Milarepa meditated. Finally, due to snow-bound passes, sixty people, who gathered from around the world for a final briefing in Kathmandu in May, discovered they were now heading for a pilgrimage around Central Tibet. And so two days later we bundled onto buses headed for the border of Nepal and Tibet disguised as tourists on a camping trip and virtually sneaked into Tibet. As Western sangha we were not allowed to wear our robes. Only the Nepali monks – Rinpoche, Geshe Sherab, and two young monk attendants – were allowed to actually be monks. I will never forget, as we all crossed over Friendship Bridge into Tibet on a group visa, filing slowly past Rinpoche and the other monks who stood there waiting to see if they would be allowed into the country. Our hearts were in our throats, not knowing whether the guru would be able to join us or not! Somehow Rinpoche made himself invisible, the passports were stamped and this dream of a pilgrimage began. Later that night, booked into Chinese hotels on the border, Rinpoche began the trip in earnest with a teaching on how to do Vajrasattva purification in the restaurant. The staff were enthralled – and I realized that Rinpoche was not going to be low-key on this trip. The next day we drove through to Nyalam [approx 4,600 metres/15,000 feet] where there is a famous Milarepa Cave. We arrived late afternoon and as our Sherpas were pitching the tents, we visited the cave, which has a small gompa attached. Rinpoche had been there twice before and the monk in charge had in fact made a guru-disciple connection with him on a previous trip. … Outside the cave at Nyalam we met a young boy whose body was hideously deformed by a skin disease. He was begging and explained to Rinpoche that he was born normal and had become like this due to disturbing local nagas. Rinpoche did prayers and told us all to do tong-len – imagining taking on his suffering. Many villagers gathered asking for Rinpoche’s blessing, especially to blow mantras on them to cure their eye diseases. This was to become another familiar scene throughout Tibet, and Rinpoche explained that this has come about due to mental and physical pollution in the country in the past decades, particularly because of the destruction of so many holy objects and due to smoking cigarettes, which disturbs the local spirits.